I too, love the simple quilts, and I am n love, right now, with quilts with white backgrounds. Good to hear from you! The new book by Bill Kerr and Weeks Ringle is on its way to me from Amazon right now. I ordered it last week and can hardly wait to get my hands on it! I have the Cherri House book. Highly recommended. Also have the Elizabeth Hartman book and while it is an excellent how-to book, she also has some great patterns in it. I would also recommend her book. It kind of makes me laugh sometimes that we feel so guilty about what and how we quilt. Bloggers telling us to think outside the box, do our own designing, and at the same time saying, "oh and by the way, click here to purchase the new pattern I just designed." I decided that I'm going to try really hard not to let what others are doing affecting what I am doing: quantity, style, fabric choice, etc. This is supposed to be relaxing not stressful. So Andrea, I say use someone else's pattern...for now...because the creativity to design your own quilts is just taking a holiday break. It'll be back! Ooo thanks for sharing about their new book. I think that is going to make my wish list this Christmas. i'm anxious to see this book in person. i just spent several minutes looking through their blog, too. (thanks for the link) i love their work and like you, the Modern Quilt Workshop was a HUGE eye opener to me. Do whatever you want to do. Your quilts are gorgeous, and whether they are your own or someone else's design, your touches make it unique. 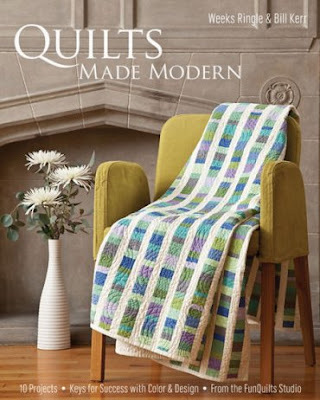 Thanks for the kind words about Quilts Made Modern. Our hope is that readers of our books will learn something new by making our patterns and that whether or not they ever design patterns of their own, they will have enjoyed making something for their home. In other words, enjoy the process, whether it's your own pattern or someone else's. Happy New Year!